llery Queen's playfulness has led fans to believe there was but one Ellery Queen figure. Many have sought a connection between all the works, seeking some great hidden plot that really did justice to their admiration. The truth however is that the figure Ellery Queen changed over the years due to influences of the times. But his relationship with his surroundings did not. It is in this comfortable atmosphere our sleuth sought and found the solution to the problems set before him. The Roman Hat Mystery (1929) introduced Ellery Queen as the son of Inspector Richard Queen of the New York police department. Together, they formed a formidable crime-solving team. Inspector Queen, in his role as a policeman, collected all the clues connected with the crime in question. His son Ellery, an intellectual and writer of detective novels, would then collect and analyze the clues, ultimately solving the crime. The product of the imaginations of two mystery writers who sign themselves "Ellery Queen," the Ellery of the books is also a mystery writer who writes about a character called "Ellery Queen." That sort of infinite regress leads to a speculative void into which any lapses of continuity in the saga can easily fit. What is important is that despite the changes, the Ellery we read about is always Ellery, filled with logic, passion, and compassion, and his father is always the same Inspector Richard Queen. Mentally Ellery is a lot like his creators. Physically this was not the case, as the nephews remarked themselves. Many fans were somewhat disappointed when during a signing-session they came face to face not with a "White Anglo-Saxon Protestant" but a balding old Jewish American with glasses. Above left: "Aristocratic, my Dear Polonius?" 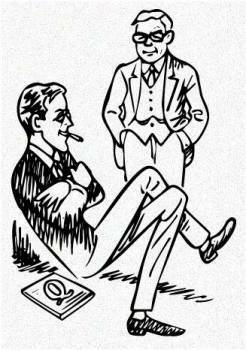 junior edition Philo Vance, a fairly recent Harvard grad wrapped in shapeless tweeds and sporting pince-nez. Considering the influence Maurice Leblanc had on Dannay we have to bear in mind the wonderful Arsène Lupin-character Leblanc created as we further get to know Ellery as a stiff shirt wearing his lornget, a thin silver watch and falconer, a gray costume and walking stick. His clothes came from Bond street. The hat (actually an Irish Walking Hat) made it into the Hutton series. Sometimes the pince-nez is referred to as a lorgnet which isn't exactly the same thing. Every time Ellery tries to put "two and two together" the pince-nez gets submitted to a thorough cleaning job. The gentleman detective's apartment on West 87th Street, New York, is as well known a s Sherlock Holmes' flat in Baker Street, London. 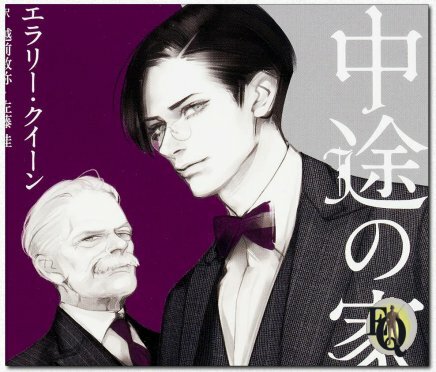 What meager personality he possesses is supplied by good suits, dark hair, and silvery eyes. The Duesenberg is one of Ellery's flings. Ellery Queen was a "supercilious aristocrat who condescendingly assisted his long-suffering father, Inspector Richard Queen of the New York Police Department." (Detectionary, Overlook Press, 1971). All in all Ellery doesn't strike us as a very sympathetic figure. One can no easily relate to a figure who seems omnipotent and so clearly driven by logic that he makes no mistakes whatsoever...almost not human... Ellery is lecturing everyone in sight, even patronizing his father. The obvious affection between them, however, makes Ellery somewhat likable. Richard seems to admit to have the "better" over his father when it comes to the matter of "the little grey cells". Father Queen seems to get his results relying on hard work whilst Ellery swears by the powers of deduction. 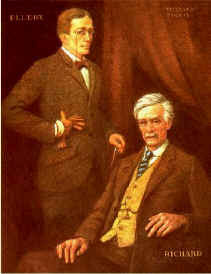 Ellery sometimes addresses his father "My dear Watson". This in fact says more about the admiration of the author than about the father-son modus operandi. Ellery's mother is mentioned as such and not as the spouse of Richard. Not much is known about her. Above: Detail cover Halfway House Japanese edition with artwork by Takenaka, publisher Kadokawa Shoten July 2015. Copyright © MCMXCIX-MMV Ellery Queen, a website on deduction. All rights reserved.